With the outbreak of the Palestinian Intifadat al-Aqsa in September 2000 that followed the failure of the Camp David II summit, the chain of belligerent events took Egypt by surprise. 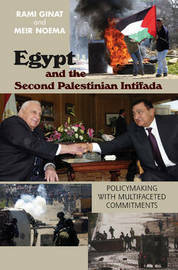 Facing a dilemma in its search for an appropriate policy towards the Palestinian-Israeli escalation, this study argues that Egypt's policy towards the second Intifada may best be understood by scrutinising several circles of reference that directly affected its policymaking process throughout the long years of the bloody Israeli-Palestinian conflict. These circles of reference comprise interests and calculations derived from Egyptian internal issues; regional factors -- Egypt's role and position in the Arab world in general, and its relations with the Palestinians in particular; Egypt's relations with Israel; and its strategic ties with the United States. The growing strength and the expansion of the global Islamic terrorist network that challenges the stability of the present Arab regimes constitutes a lynchpin at every layer. Egypt's foreign policy is based on Realpolitik, that is, on pragmatic and material factors rather than on ideological or moral considerations. Safeguarding its national interests is Egypt's prime goal. In this regard, Egypt considers the peace with Israel as a strategic national asset. For Mubarak's regime, the abrogation of the peace treaty with Israel has never been an option, even during the worst days of the Intifada. Mubarak has shown exemplary restraint throughout the conflict. Despite occasional harsh anti-Israeli statements aimed mainly at easing internal and external pressures, Mubarak's regime can, on the whole, be seen as a responsible and stabilising factor vehemently striving to prevent regional escalation. This study is based primarily on Egyptian sources as well as interviews and conversations with senior members of the Al-Ahram Center for Strategic Studies. It also draws on other primary and secondary sources in Arabic, Hebrew and English. The book is essential reading for all scholars involved and engaged with the Israel-Arab conflict. Rami Ginat is Senior Lecturer at the Department of Middle East History, Bar-Ilan University, Israel. He is the author of The Soviet Union and Egypt, 1945-1955 (London: 1993) and Egypt's Incomplete Revolution (London: 1997). He has published widely in various journals, including Middle Eastern Studies, International Journal of Middle East Studies, British Journal of Middle Eastern Studies, Diplomacy and Statecraft. Dr Meir Noema is a lecturer in the Department of Sociology, Political Science & Communications, Open University, Israel. He received his Ph.D. from Bar-Ilan University and has published articles on Egyptian affairs.